Substance use is associated with increased risks and prevalence of HIV, hepatitis, and other sexually transmitted infections (STIs). According to the World Health Organization (2016a), of the 2.3 million people worldwide that are co-infected with HIV and the hepatitis C virus (HCV), over 60% (1.4 million) are injection drug users. Untreated substance misuse can delay identification and treatment of STIs including HIV and hepatitis and increases the risk of transmission to others. Substance misuse can reduce the efficacy of HIV and other STI treatments and can increase progression of HIV disease. This course will show you the scope of the problem and present you with evidence-based tools to identify and address substance misuse in the populations you serve. You will learn about available treatments for HIV, hepatitis, and other STIs as well as how alcohol and other drug use can interfere with treatment adherence and efficacy. This course is suitable for healthcare professionals including providers in primary care, family planning, community health programs, mental health and substance use disorder treatment programs, and hospital-based programs. Describe 3 ways that substance use can increase the risk of contracting or transmitting HIV, hepatitis B and C, or other sexually-transmitted infections. 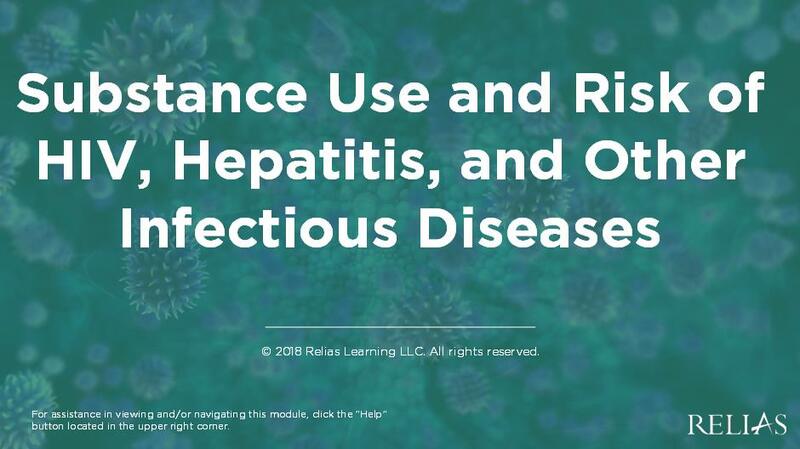 Describe treatments for substance use disorders, HIV, and hepatitis B and C.
Summarize the elements of a comprehensive SUD/STI prevention strategy. Explain 2 counseling strategies to address identified sexual or substance use risk behaviors. What is HBV and HCV and How are They Transmitted? Dr. Reil is a licensed psychologist and psychiatric nurse practitioner who specializes in co-occurring mental-health, substance use, and physical-health disorders. She is versed in evidence-based and promising practices, including motivational interviewing, cognitive behavioral therapy, contemplative psychotherapy, and integrated wellness self-management. Dr. Reil received her MA and PhD from the New School Graduate Faculty Political and Social Science. She has a BSN from Pace University and an MSN from the Sage Colleges School of Health Sciences in the area of advanced practice psychiatric nursing. She is a speaker and educator on mental health and substance use topics as they relate to at-risk individuals and those with chronic health disorders such as diabetes, cancer, and HIV/AIDS. Dr. Reil consults with public and private organizations and individuals to design and deliver educational materials that are interactive, engaging, and reflect the most recent evidence-based and promising practices. Disclosure: Marlene M. Reil has declared that no conflict of interest, Relevant Financial Relationship or Relevant Non-Financial Relationship exists. The target audience for this course is: advanced level Alcohol and Drug Counselors; advanced level Social Workers; entry level Psychologists; intermediate level Professional Counselors; Nurses; in the following settings: Health and Human Services.